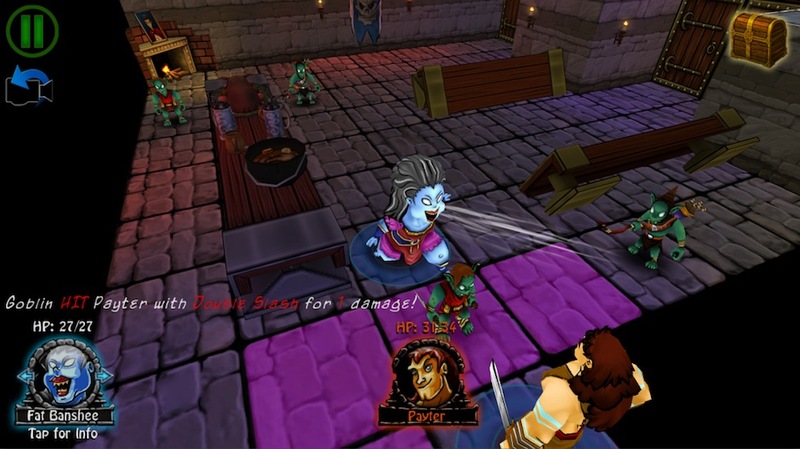 Ayopa Games‘ and Drowning Monkeys‘ next title is a 3D, close-quarters strategy RPG with the usual trimmings: ghouls, ghosts, swords, sorcery, dungeon crawling, and leveling are all a part of the package. It’s as functionally classical as its name, Dungeon Crawlers, implies, and nothing mechanical I’ve seen seems to be breaking any mold. There is this one thing, though. It’s kinda quirky. 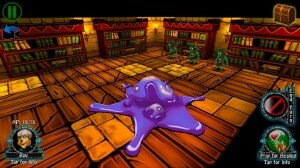 In the opening moments, one of the party members clearly references Ghostbusters. Roy, the healer, carries around a weapon called “The Unreturned Library Tome." When you search the first weapon rack you find, it calmly tells you that while there’s tons of weapons here, none of them are indeed yours. Dungeon Crawlers, which is due out later this month, is straddling a fun line. It’s the video game equivalent of a mullet, reserved and business-like, yet fun-loving and goofy. What makes it a strategy RPG isn’t messed with, but the story, the weapons, and even the item pick-ups are all tinged with a lightheartedness that I’m OK with seeing — especially since fantasy is so stale. The business part is good, by the way. After putting some time into a preview build, I feel like I can lazily sum up the mechanics as “Shining Force Meets Diablo." There’s a lot of traditional strategy RPG in the combat, but you also freely move around and explore a dungeon in-between fights. 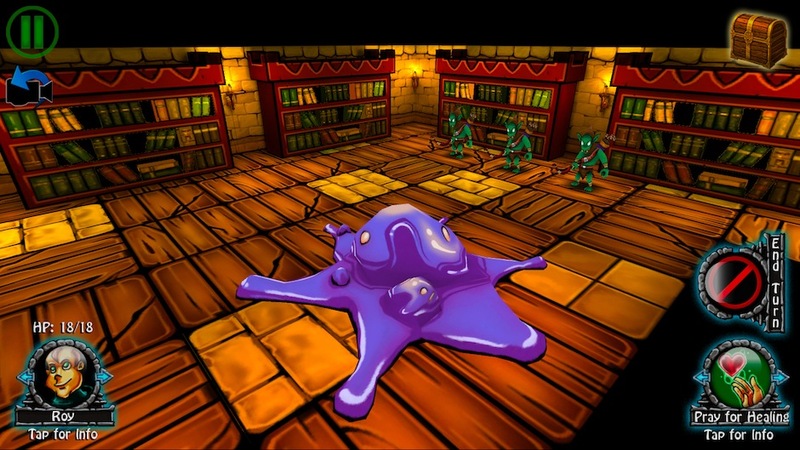 A typical confrontation goes a little something like this: the battleground morphs into a series of tiles, all of which can be accessed through turn-based play; blue titles indicate a movement can occur, red alerts you to the fact that you can attack, and green lets you know that healing can happen. Simple taps activate the action, while swipes allow you to move fluidly through skill menus. Pop an enemy enough, it dies. Rinse and repeat. Kill enough dudes, and you level up and gain access to new skills that, of course, allow for a wider range of tactical options. Cleave, for instance, hits in a three square arc, while magic missile attacks from four spaces away. The overall strategy boils down to a touch of structural awareness, a heavy helping of positional wrangling, and a solid understanding of skill sets and AI behavior. There’s some wrinkles. Boss fights promise some more interesting situational content. In the first fight, for example, the goal is to reach a goblin king in his throne instead of delivering his head on a platter. Later, you’ll see some puzzles and solo action. Speaking of characters, you start out with three knuckleheads: a womanizing barbarian, a nerdy sorcerer, and a gluttonous healer. Their banter is inviting, and the situation the trio find themselves in is something straight out of Ghostbusters. Weird influence, right? I asked Drowning Monkeys what’s up, and I was relieved to find that I wasn’t crazy. “… the actual idea for the story came while we were prototyping the game, and we had created our archetypes. We were designing the characters and noticed the similarities to Ghostbusters, so we ran with it and started creating a story around that basic element." “The idea that something ‘big’ was happening, and that the characters were initially motivated by money and not because of a ‘call’ to do great things. I think in the end though, we actually have created a story that is unique and keeps the player interested in seeing what happens next." Humor is subjective kinda like quality is, so it’ll be interesting to see how Dungeon Crawlers clicks with everyone. I dig it. More importantly, though, I think the game part of it is on the right track. In its pre-release form, it feels almost as good as any of the great games in the genre, and I’ll be excited to dive in for the haul. 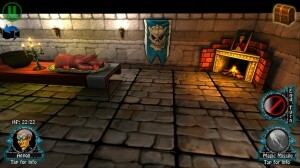 If all goes well, Dungeon Crawlers will see a release this January 26 across iPad, iPod Touch, and iPhone. We’ll definitely keep our eye on it, and I’m thinking you should, too.